Focuses on the issue of the relationship between the Christ of faith and the Jesus of history. A revision and expansion of the earlier work. Characterizations of Jesus abound: dying Savior, monk, or troublemaker, for example. But who is Jesus? Who was Jesus-really? 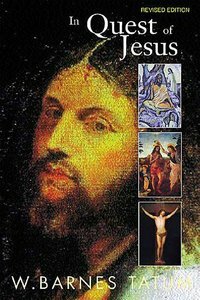 By surveying literary sources (including the Gospels), historical reconstructions, and aspects of Jesus' life and ministry that have engendered continuing debate, Tatum enables readers to develop a conceptual framework for evaluating the various cultural and scholarly expressions of the Jesus story. About "In Quest of Jesus (Edition 1999)"
Tatum is Professor of Religion and Philosophy at Greensboro College, Greensboro, North Carolina.